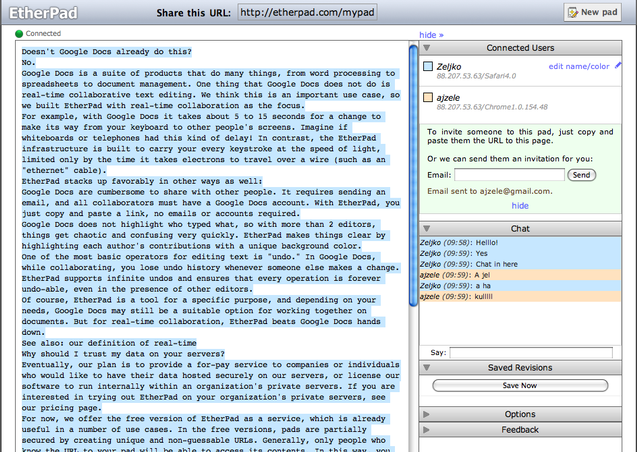 EtherPad • Online real time text editing that works. Online and real time text editing that works! What is etherpad? It’s an real-time collaborative text editing online application. As they state on their site “Etherpad” is a “Really real-time collaboration”. That means no delay between writing or editing your shared document. It has built in versioning, chat and requires no registration for anyone in the free version. It gives online conferencing a whole new level with the ability to instantly create a new writing pad with a unique URL which you then share with your collaborator(s). You get the unique URL to the document or you can choose one buy simply pointing your browser to the URL you wish to create on etherpad’s site and your file is there forever. All you need to do is to bookmark the page and that’s it. For example: I pointed the browser to the http://etherpad.com/mypad and that was it. Although there’s the omnipresent Google docs for “real time” collaboration and if you used it you know how this works, you should give this one a go.